Dr Frank Schmidt was invited to give a keynote talk in the session entitled Infectious disease and Microbiome at the British Society for Proteome Research (BSPR) meeting 2016, July 25th - 27th, The University of Glasgow, Scotland. The 4th and Statusseminar of the Competence Centre Functional Genomics (ZIK FunGene) took place February 16th at the Alfried Kupp Wissenschaftskolleg Greifswald. Scientists, representatives of the public interest, and collaboration partners were invited to join the final Statusseminar. Invited speakers looked back at many successful years of proteomics research in Greifswald but also discussed future developments of functional genomics in Greifswald. The junior research leaders Frank Schmidt (Applied Proteomics) and Falko Hochgräfe (Pathoproteomics) presented the results and achievement of 5 years ZIK FunGene. Kristin Surmann visited our collaboration partners Maria Eugenia Rodriguez and Yanina Lamberti (Investigadora Asistente CONICET, Lab. de Microbiología Celular e Inmunomecanismos, CINDEFI, La Plata, Argentinien) for four weeks in October 2015. The working group is mainly focussing on the pertussis germ Bordetella pertussis . Kristin conducted infection experiments on the bacteria. Future visits are planned. 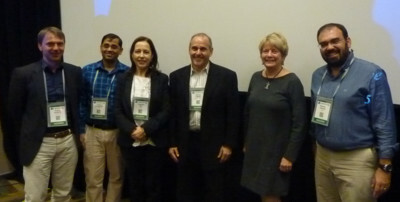 Dr Frank Schmidt, Dr Stephan Michalik and Nandakumar Sundaramoorthy represented the junior research group "Applied Proteomics" at the Annual World Congress of the Human Proteome Organization (HUPO) , September 27 - 30, Vancouver, Canada. Dr Frank Schmidt presented the latest work of the junior research group in two talks. Stephan Michalik gave one talk. Dr Frank Schmidt will represent the junior research group "Applied Proteomics" at the 4th International Congress on Analytical Proteomics (ICAP), September 07 - 09, Costa de Caparica, Lisbon, Portugal. He will give a talk on "S. aureus specific proteome analysis for the characterization of host-pathogen interactions". Dr Frank Schmidt was invited to give a talk on "A combined proteomics approach for the characterization of the human adaptive immune response to S. aureus antigens" at the EuPA Congress, June 23 - 28, Milano, Italy. The Journal of Proteomics named Dr Frank Schmidt section editor for 'Proteomics in Microbiology'. Dr Frank Schmidt was invited to give a talk on "S. aureus specific proteome and immuno-proteome analysis for the establishment of specific signatures of infection" at the 12th International Life Science Meeting, April 15 - 17, Krems, Austria. We invited Suzana Salcedo from Lyon and Anja Lührmann from Erlangen to give a talk on their current research on host-pathogen-interactions. The talks will be on March 18th at the Hörsaal Microbiology. A new funding support by the Federal Ministry for Economic Affairs and Energy (BMWi) within the framework of the Central Innovation Program SME (Zentrales Innovationsprogramm Mittelstand – ZIM) was granted. Congratulations on the graduation of our (former) bachelor student Alexander Rabe, master student Tanja Meyer and PhD student Kristin Surmann. Well done! We wish you all the best for the future. We invited Ulrike Kusebauch from the Research Scientist Institute for Systems Biology, Seattle, USA to give a talk on the Development of comprehensive quantitative proteome resources and applications to disease diagnostics. The talk will take place December 11th at the Hörsaal Ost. The 3rd Statusseminar of the Competence Centre Functional Genomics (ZIK FunGene) takes place December 1st. Professor Michael Hecker, speaker of the ZIK-FunGene, invited scientists and representative of public interest to celebrate 10 years of ZIK-FunGene in Greifswald. Beside the rector of the University of Greifswald, Professor Johanna Eleonore Weber, even the minister for Education and Science, Professor Johanna Wanka will attend to celebrate this anniversary. After short welcome speeches, Professor Johanna Wanka, Professor Heyo K. Kroemer and Professor Ernst Rietschel would like to give some interesting talks in honour of the occasion. This year's DGFZ will take place in Dresden (15-17 October). Dr Frank Schmidt will be session chair for 'Big Data in Cytomics'. Dr Petra Hildebrandt will present new data on FACS analysis. Dr Frank Schmidt and Dr Manuela Gesell Salazar will represent the junior research group "Applied Proteomics" at the Annual World Congress of the Human Proteome Organization (HUPO) , October 04 - 08, Madrid, Spain. Dr Frank Schmidt will present the latest data on proteome mapping in collaboration with our partners from ETH Zurich and ISB Seattle. Furthermore Dr Schmidt is now member of the specialist team in the 'Infectious Diseases (HID-HPP) Initiative'. The Department of Microbiology and Infection Control, Akershus University Hospital, Oslo, Norway is new partner of the junior research group 'Applied Proteomics'. In cooperation with our partner Professor Barbara Bröker (Immunology, Greifswald) and Dr Hege Vangstein Aamot (Akershus University Hospital, Oslo) we will analyse specific Staphylococcus aureus immunoproteomics profiles in sepsis patients. Granted by the Norwegian Research Council as well as the Norwegian Regional Health Authorities. For four days part of our team participated in a beneficial GeneData training in Basel. Our letter "Rare and low-frequency coding variants in CXCR2 and other genes are associated with hematological traits" has been accepted for publication in the next issue of Nature Genetics. New lectures have been announced. Please see our Lecture tab for details. The 2nd Statusseminar of the Competence Centre Functional Genomics (ZIK FunGene) takes place December 4th. The junior research group "Applied Proteomics" will participate at this year's Allergy School "The place of "omics" in the diagnostic lab - Update on A&CI laboratory methods", Greifswald (7-11 October). The school is organised by the EAACI Interest Group on Functional Genomics & Proteomics and the University Medicine Greifswald. Dr Frank Schmidt is invited to talk about "Proteome-wide characterisation of bacterial antigenic proteins"
Invited speaker Dr Petra Hildebrandt will represent the junior research group "Applied Proteomics" at this year's Conference of the German Society for Cytometry (DGfZ) in Dresden (9-11 October). Topic of her talk will be: "Labeling of Staphylococcus aureus with fluorescent or para-magnetic nano-particles highlights new capabilities for following host-pathogen interactions"
Dr Frank Schmidt will meet our research partners from the Institute of Systems Biology (ISB) in Seattle, USA. He will discuss current research results as well as future perspectives. Dr Frank Schmidt and Dr Stephan Michalik represent the junior research group "Applied Proteomics" at the Annual World Congress of the Human Proteome Organization (HUPO) , September 14 - 18, Yokohama, Japan. Topic of this year's HUPO is "The Evolution of Technology in Proteomics". Invited speaker Dr Frank Schmidt will talk about "In Deep Characterization of the Host Pathogen Interaction During Internalization of Staphylococcus aureus by A549 Cells". Dr Frank Schmidt is invited to be Guest Editor for Frontiers which recently became part of the Nature Publishing Group. Frank and his two colleagues will be Topic Editors for "Environmental Microbiology at the Single Cell Level". The ZIKs Fungene (Greifswald) and Septomics (Jena) intensify their co-operation by the foundation of a META ZIK. 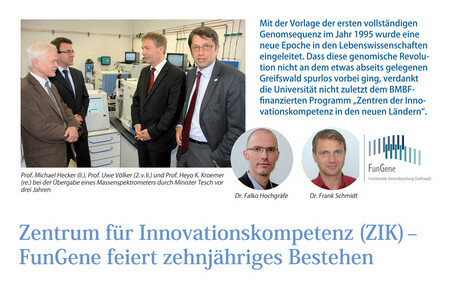 The new project is funded by the BMBF for three years. Expertise in the fields of Proteomics (Greifswald) and sepsis research (Jena) will be combined to identify novel biomarkers for sepsis.